The use of specific non-covalent interactions to control polymer structure and properties is a rapidly emerging field with applications in diverse disciplines. Molecular Recognition and Polymers covers the fundamental aspects and applications of molecular recognition—in the creation of novel polymeric materials for use in drug delivery, sensors, tissue engineering, molecular imprinting, and other areas. 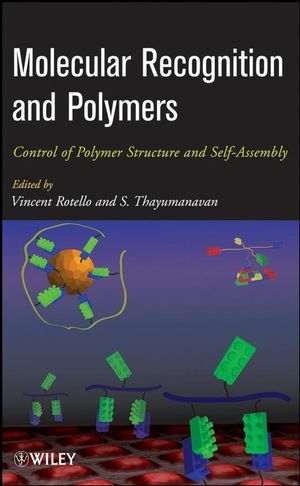 This reference begins by explaining the fundamentals of supramolecular polymers; it progresses to cover polymer formation and self-assembly with a wide variety of examples, and then includes discussions of biomolecular recognition using polymers. Vincent Rotello is the Goessmann Professor in the Department of Chemistry at the University of Massachusetts, Amherst. 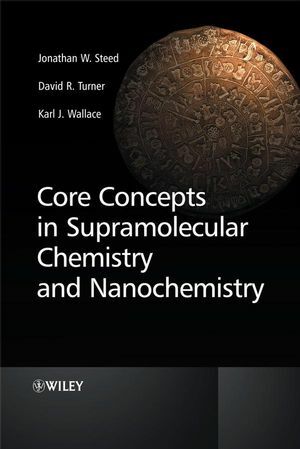 His research emphasizes achieving a fundamental understanding of supramolecular chemistry and applying it to issues in biology and nanoscience including delivery, sensing, and devices. S. Thayumanavan is a Professor in the Department of Chemistry at the University of Massachusetts, Amherst. His research focuses on the design and synthesis of novel macromolecules (dendrimers and polymers) that have applications in chemistry, biology, and materials science. Examples of these applications include catalysis and transport, drug and gene delivery, and light harvesting and sensory materials. PART I: FUNDAMENTALS OF SUPRAMOLECULAR POLYMERS. 1. A Brief Introduction to Supramolecular Chemistry in a Polymer Context1 (Raymond J. Thibault and Vincent M. Rotello). 1.2 Main-chain versus Side-chain Supramolecular Polymers. 2. Molecular Recognition Using Amphiphilic Macromolecules (Malar A Azagarsamy, K. Krishnamoorthy, and S. Thayumanavan). 3. Supramolecular Control of Mechanical Properties in Single Molecules, Interfaces and Macroscopic Materials (David M. Loveless, Farrell R. Kersey and Stephen L. Craig). 3.2 Mechanical Properties of Linear Supramolecular Polymers. 3.3 Mechanical Properties of Supramolecular Polymer Networks. 3.4 Mechanical Properties in Supramolecular Polymers at Interfaces. 3.5 Mechanical Forces and Supramolecular Interactions. PART II: POLYMER FORMATION AND SELF-ASSEMBLY. 4. Hydrogen Bond Functionalized Block Copolymers and Telechelic Oligomers (Brian D. Mather and Timothy E. Long). 4.1 Scientific Rationale and Perspective. 4.2 Hydrogen Bonding Interactions in Macromolecular Design. 4.2.1 Fundamentals of Hydrogen Bonding. 4.2.2 Performance Advantages of Hydrogen Bond Containing Polymers. 4.3 Hydrogen Bond Containing Block Copolymers. 4.4 Telechelic Hydrogen Bond Functional Polymers. 4.5 Combining Hydrogen Bonding with other Non-Covalent Interactions. 4.6 Reversible Attachment of Guest Molecules via Hydrogen Bonding. 5. NonCovalent Side Chain Modification (Kamlesh P. Nair and Marcus Weck). 5.2 Strategies Towards Noncovalent Side-Chain Functionalization of Polymeric Scaffolds. 5.3 Noncovalent Multifunctionalization of the Side-Chains of Polymeric Scaffolds. 5.4 Applications of Noncovalently Functionalized Side-Chain Copolymers. 6. Polymer-Mediated Assembly of Nanoparticles Using Engineered Interactions (Hung-Ting Chen, Yuval Ofir, and Vincent M. Rotello). 6.2 Design of Nanoparticles and Polymers. 7. Metallosupramolecular Polymers, Networks, and Gels (Blayne M. McKenzie and Stuart J. Rowan). 7.3 Linear and Macrocyclic Main-Chain Metallo-Supramolecular Polymers. 7.4 Metallo-Supramolecular Networks and Gels. 8. Polymeric Capsules: Catalysis and Drug Delivery (Brian P. Mason, Jeremy L. Steinbacher, and D. Tyler McQuade). 8.4 Drug Delivery with Microcapsules. 9. Sequence-Specific Hydrogen-Bonded Units for Directed Association, Assembly and Ligation (Bing Gong). 9.2 General Design: Information-Storing Molecular Duplexes Based on the Recombination of H-Bond Donors and Acceptors. 9.3 Quadruply H-Bonded Duplexes with Sequence-Independent Stability. 9.4 Tuning Binding Strength by Varying the Number of Interstrand H-Bonds. 9.6 Unexpected Discovery: Duplexes Containing Folded Strands. 9.7 Directed Assembly: Formation of β-sheets and Supramolecular Block Copolymers. 9.8 Integrating Non-covalent and Covalent Interactions: Directed Olefin Metathesis and Disulfide Bond Formation. 9.9 Conclusions and Future Perspective. 10. Bioinspired Supramolecular Design in Polymers for Advanced Mechanical Properties (Zhibin Guan). 10.2 Biomimetic Concept of Modular Polymer Design. 11. The Structure and Self-Assembly of Amphiphilic Dendrimers in Water (Hui Shao and Jon R. Parquette). PART III: BIOMOLECULAR RECOGNITION USING POLYMERS. 12. Colorimetric Sensing and Biosensing Using Functionalized Conjugated Polymers (Amit Basu). 13. Glycodendrimers and Other Macromolecules Bearing Multiple Carbohydrates (Mary J. Cloninger). 13.5 Comments Regarding the Synthesis of Heteromultivalent Carbohydrate Systems. 13.6 EPR Characterization of Heterogeneously Functionalized Dendrimers. 14. Supramolecular Polymerization of Peptides and Peptide Derivatives: Nanofibrous Materials (He Dong, Virany M. Yuwono, and Jeffrey D. Hartgerink). 14.2 Self-Assembly of Nanofibers Based on Alpha-Helices. 14.3 Nanofibers Self-Assembled from Beta-Sheets. 15. Molecular Imprinting for Sensor Applications (Xiangyang Wu and Ken D. Shimizu). 15.1 Introduction to Sensing Platforms. 15.2 Synthesis of Molecularly Imprinted Polymers. 15.3 Recognition Properties of MIPs. 15.4 Polymer Formats and Morphologies. 15.5 Application of MIPs in Sensing.